If you’ve ever had an in-depth conversation with a designer, you’ve probably been bombarded by letter combinations like CMYK, RGB, DPI, and odd terms like bleeds and spot colors. We designers throw these terms around all the time, maybe without realizing that not everyone lives and breathes these things like we do. This is the first post in a new series aimed at de-mystifying design lingo. I’m going to start with decoding just a few basics in this article, namely the acronyms pertaining to color profiles. They are: CMYK, RGB, and PMS. Cyan Magenta Yellow Key (black): also called process color or 4-color – CMYK is a subtractive color model, meaning that white (the paper color) is achieved by subtracting amounts of color, and black is a combination of all of the colors. This is the color setup used by all professional printers and your home printer, too. I like to call this the ink-based color setup, as that is the medium CMYK is generally in reference to. While certain computer programs (mainly in the design field) can handle the display of CMYK images, it is meant for printed pieces rather than digital formats. There are certain colors that CMYK inks can produce which are impossible to represent on a computer screen (see gamut image below). Red Green Blue: in contrast to CMYK, RGB is an additive color model, meaning that white is produced by combining all colors and black is the lack of all color. This is the color setup that your computer monitor and TV use, as well as all web graphics and online images. I refer to this as the light-based color setup, as it is the setup used by all electronic devices that display color based on pixels made up of light. While home printers and digital presses can print pieces submitted in RGB, the color conversion will not be completely accurate. RGB is meant more for digital/electronic mediums than printed materials. 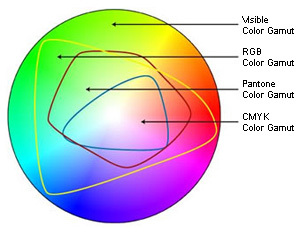 There are certain colors that a computer monitor can display using RGB/light that are impossible to print using CMYK inks (see gamut image below). Pantone Matching System: contrary to what popular usage of this acronym may imply, in the design world PMS has nothing to do with mood swings. The Pantone Matching System is a series of special, pre-mixed inks that can be used in place of or in addition to CMYK inks. Essentially, a PMS color (often called a spot color) is an ink mixed to a very specific formula based off of 13 base pigments – for this reason, many of the Pantone system’s colors cannot be reproduced exactly by CMYK. It’s like ordering a can of paint and using that to paint your wall, rather than buying 4 different colors of paint (CMYK) and mixing on the wall itself. It’s a much more precise color system, but also generally more expensive to run if you’re using more than one or two spot colors as each ink requires its own plate on the printing press. Pantones are great to use if you need a specialty ink, such as metallic or flourescent, or if the identity standard requires an exact color match every time even if different designers or different printers are handling the work. Pantone makes color swatch books that display how each ink prints on coated or uncoated paper. See the Pantone website. I hope that helps clear up the difference between color profiles! 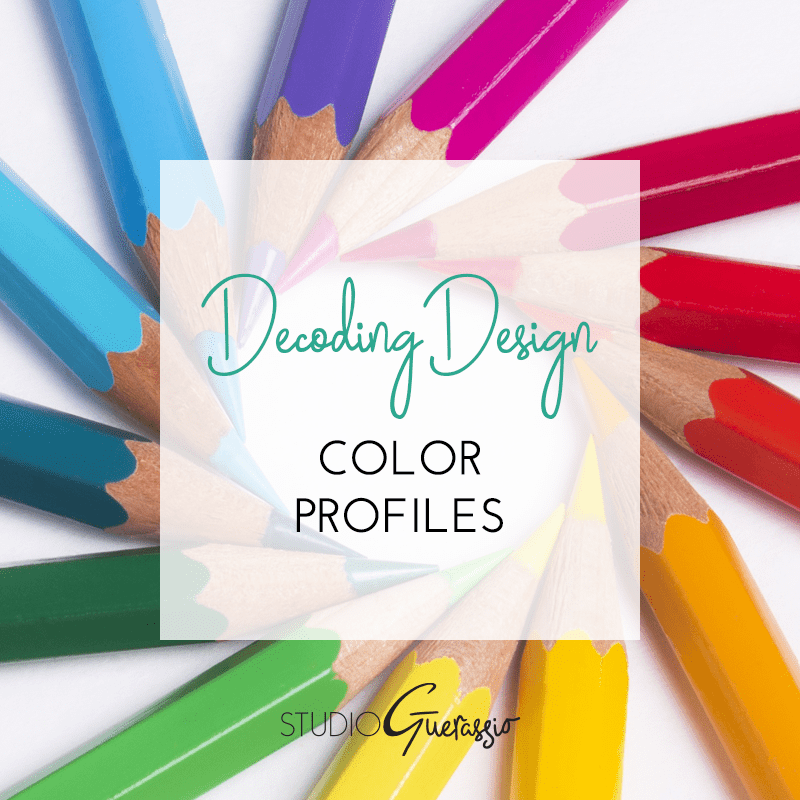 Do you have a question about color profiles or design that I could answer in this Decoding Design series? Let me know below!